But I'm going to show you guys anyway. We'll chalk it up to a learning experience. I got this idea from my friend's manicure, she got it done pink french tips with a silver smile line & I had every intention of taking a pic ... but didn't. I wanted to recreate it, and I'm pretty happy with the colors I chose, but I failed in the execution. 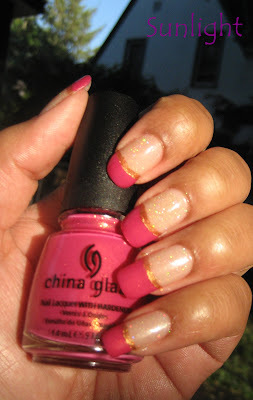 I usually use guides when I do french tips, and as long as I am very careful applying them they work pretty good. I guess today I was a little impatient or distracted or something, because I ended up with a mess. And that's where the problem started ... 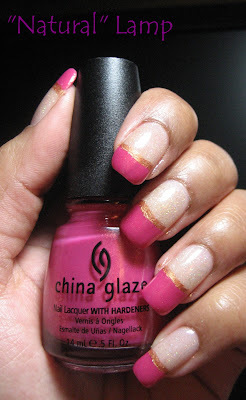 I thought I'd cover up the messy edge with a gold line, since this pink has a lot of gold shimmer. 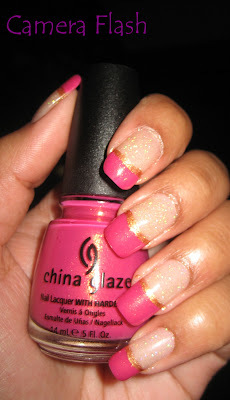 But, putting it under the existing pink tip, I think it ended up too low, it makes my nail beds look stunted. I should have put the gold line on top of the pink instead of under it, or tried to clean up the pink edge & skipped the gold all together, since freehand is not my forte & it came out kind of thick & messy. Either way, I didn't hate it enough to remove it right away, but I think this will probably come off tomorrow. Soooo close ... but not quite what I had in mind & so no cigar. Thanks for reading. That's too bad. But it looks very nice in the photos. I like the picture that shows the sparkle. You can see the rainbow of colors in the shimmer. The color combo is perfect and instead of focusing on how short they make your nailbeds look, I see how long they make your nails appear! VELVET - Golden Enchantment has a lot of holo when the light hits it, I was catching the sun on the way down but I wanted to get a shot. I think this is great! I love it. Colette your manicure is so pretty. I like all the shimmer. I like your so called mess of a manicure. Your nails are long so they don't look stunted to me. This is cute! I had the same idea but with the silver, pink french manicure. I dont think it turned out well on me. I like yours though! I've done that before - but it really doesn't look bad. 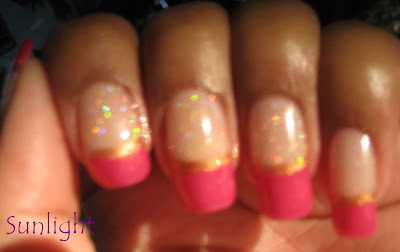 :-) Gorgeous sparkle, I bet no one will even notice that the tips are too wide (you'll probably start a new trend)! This is sooooo pretty! It takes me a while to warm up to new things, too. I enlarged the pics and it looks just fine. CANISTROTTER - Welcome =) I've considering giving a diagonal french a try, but the closest I've come so far is a diagonal Konad design. CLOCKWORK - It somehow manages to look better in the pics than it does in real life LOL.